This is installment six of a 12-part series on grasses. Read the previous installment here. Even though I’m a cat person, every February I love to watch the two-day spectacle of the Westminster Kennel Club Dog Show. I’m just a taxonomist at heart, and I enjoy spotting the subtle differences between the American foxhound, Harrier, and English foxhound; or how the different groups came to be and why the Non-Sporting group is such a mish-mosh of breeds. But there are also the subtle cautions offered by announcer David Freese that make me think of gardening: Know your breed and pick the one that’s right for you, and don’t buy into the “fad” or “popular” breeds (e.g., dalmations after “101 Dalmations” came out, or whatever breed wins the WKC). And that brings me to pampas grass (Cortaderia sp.). 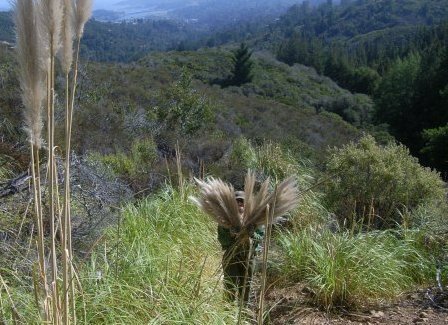 California’s pampas grasses are two very similar-looking but reproductively different species, and just like irresponsible breeders can churn out sick dogs to capitalize on a fad, irresponsible or ignorant plant breeders can inadvertently introduce pest plants or diseases in trying to create or capitalize on a fad. According to this excellent article in the 2004 Cal-IPC news, pampas grass (C. selloana) was originally brought up from the South American pampas for its striking inflorescences. The white, fluffy plumes are only produced by the female plant; the male plant’s plumes are darker and thinner. So for a while, only female plants were planted and exported, and no spreading could happen without the males. But fads catch on, and inevitably the male plants made their way into the world, as did the similar-looking purple pampas grass (or as I prefer to call it, jubata grass, C. jubata). Jubata grass, nearly opposite the outcross-dependent pampas grass, is apomictic—seeds form from the female ovules without fertilization. This allows it, like the also-apomictic and wind-dispersed dandelion (Taraxacum officinale), to establish new colonies over long distances and take advantage of disturbances. Most of what we have in Marin is jubata grass; proper pampas grass is mostly strictly coastal, and found in San Mateo and Southern California (although the Richmond-San Rafael Bridge corridor is an excellent spot to see both species side-by-side). Because of its need to outcross, pampas grass can be slower to establish since the winds of chance need to blow both male and female plants within pollination distance. But that also means it may be able to adapt to changes and eventually invade more areas. 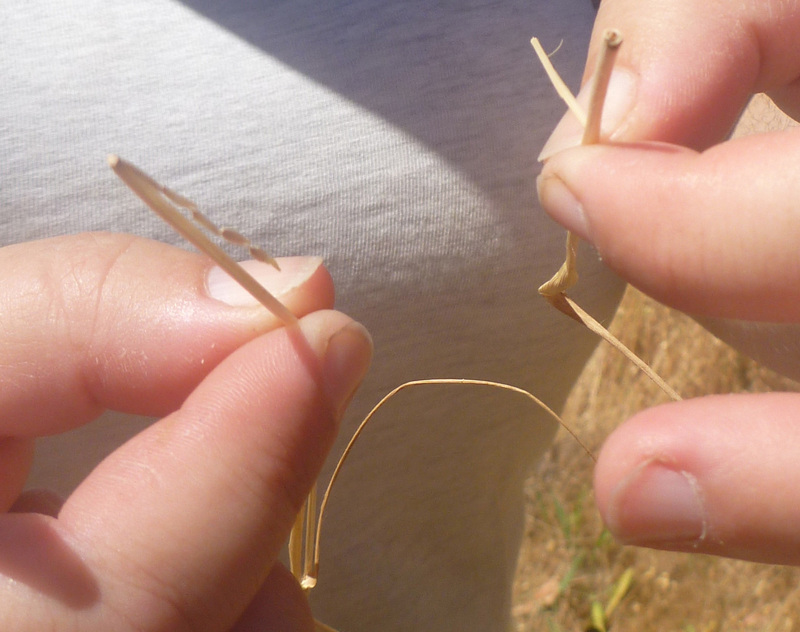 The hare to pampas’ tortoise, jubata grass quickly covers disturbed and difficult-to-reach sites such as roadcuts and landslides. We try to keep on top of our populations on Tam, and have managed to mostly keep it contained in a few sites and prevent seeding. The good news is, although the seeds are numerous and far-slung—over 1,000,000 per plant traveling many miles on the breeze—they are short-lived, usually only a year. So once the adults are treated and re-invasion of bare ground is minimized, the follow-up is minimal. Better, though, if we’d had an ounce of forethought and prevention a century ago, and not introduced such an aggressive breed. An aside/post-script: Speaking of capitalizing on fads, a recently invading ornamental (Erigeron karvinskianus) that used to be called “Mexican fleabane” is now being called “Santa Barbara daisy” and people are buying and planting thinking it’s a California native … which it’s not! This is installment four of a 12-part series on grasses. Read the previous installment here. I’m sure you’ve heard the phrase “sowing your wild oats,” but did you know that California wild oats (aka California oatgrass, Danthonia californica) is the grass that loves you back? And they have a secret seed to sow? 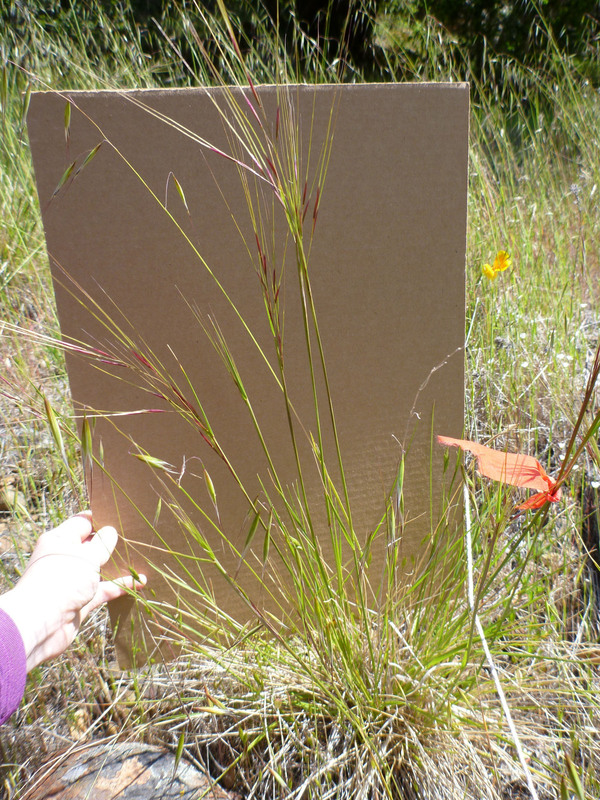 I grew to know California oatgrass in Oregon, when I spent my summers on a coastal grassland studying the habitat of the threatened Oregon silverspot butterfly. At first I just liked how obvious it was, three fat spikelets and a little eyelash winking at you where the grass blade met the stem. It wasn’t until my time at Redwood National and State Parks that I appreciated the ingenious strategy this grass employs in reproduction. And it wasn’t until last month that I fully appreciated just how hardy and long-lived California wild oats can be. Most grasses, California oatgrass included, reproduce through wind-pollinated flowers that turn into seeds; think wheat or rice grains. But oats, California oatgrass included, are tasty and can be browsed down before they have a chance to become a new plant. 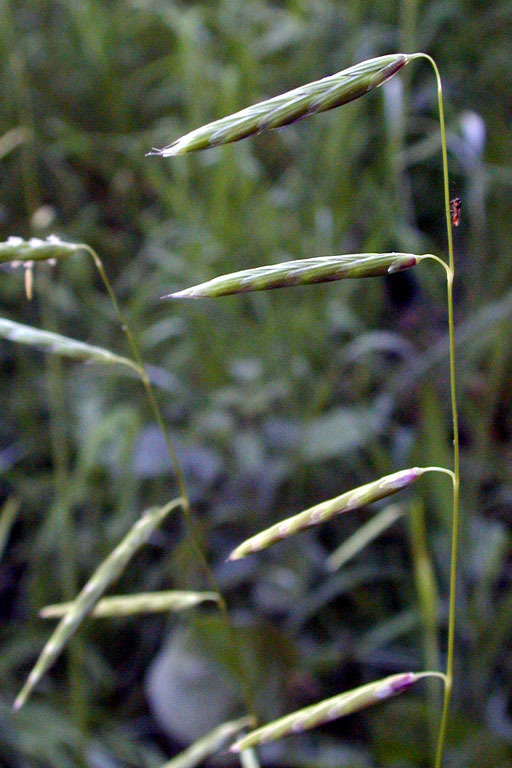 California oatgrass has a contingency set of seeds in the base of its flowering stalk. These flowers are cleistogamous, meaning—like nuns in a cloister—they are kept shut away. The flowers self-pollinate inside the stem, and when the upper (chasmogamous, opening, like a yawning chasm) wind-pollinated flowers have ripened into seeds and are ready to drop, the stem itself detaches from the basal clump of leaves. This gave rise to a new dance, the “Danthonia Shuffle,” during a native grass seed gathering expedition. Rather than plucking individual seed heads, you can shuffle your feet through an oatgrass-laden path and once a sufficient number of stems have gathered around your shins, just scoop the whole lot up into a bag! You not only have the seeds that haven’t dropped from the seed heads, but you have the straw and the secret seeds as well! California oatgrass, once established, is a hardy and forgiving plant that tolerates mowing well. 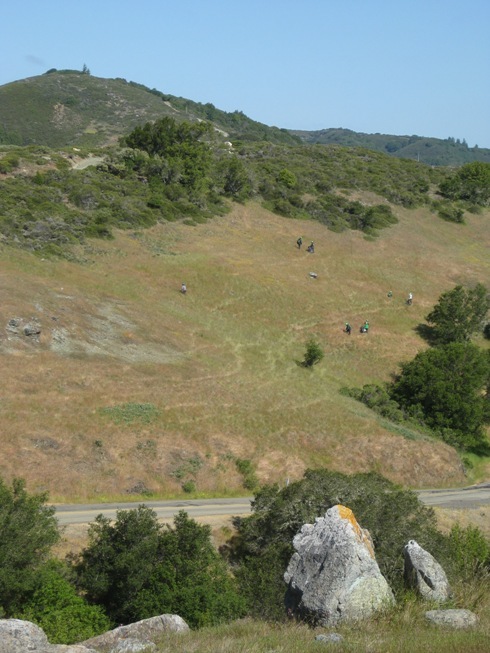 It does prefer wetter areas in grasslands, where it mixes with purple needlegrass, blue-eyed grass, and the cheery yellow of California buttercups. On Mt. 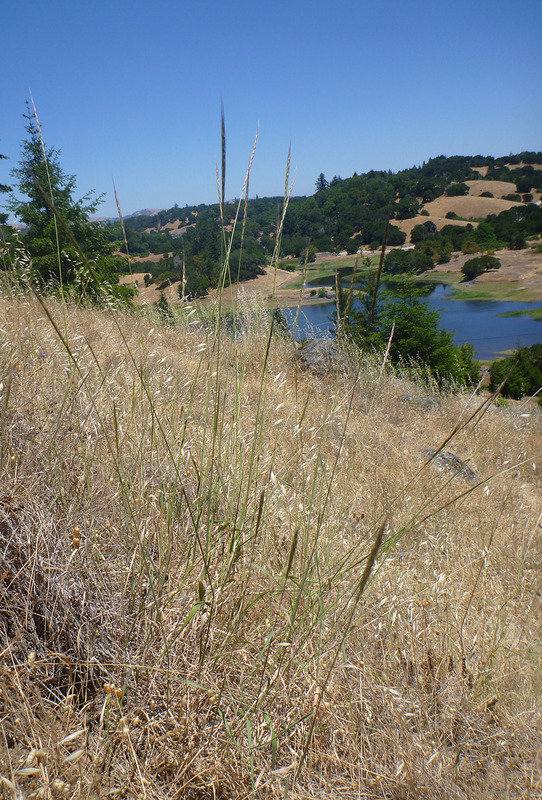 Tamalpais, our oatgrass tends to have three to five spikelets above a clump of slightly greyish green leaves. On the coast, plants tend to be a little greener. Last month, as I was staffing the California Native Grassland Association booth at the Point Molate Beach opening, I looked down at the mowed-and-trampled ground and saw a little oatgrass eyelash winking up at me from an emerald clump of leaves—California oatgrass had survived decades of people walking and mowing and picnicking and parking on it. And why is it the grass that loves you back? The arrangement of spikelets matches the hand symbol for “I love you” in sign language. What’s That Grizzly Walkin’ On? This is installment two of a 12-part series on grasses. Read the previous installment here. 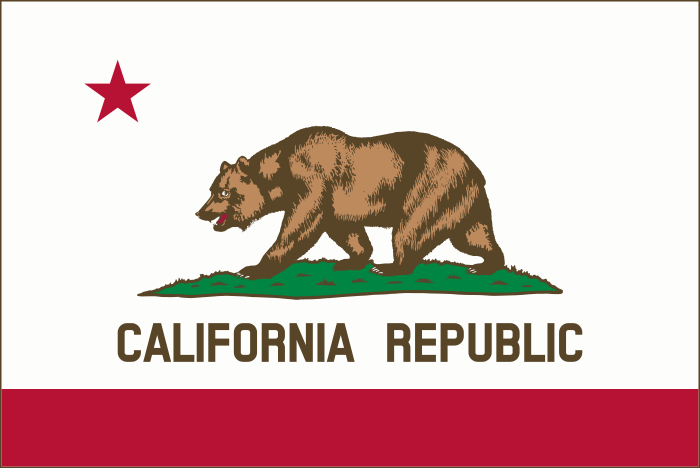 You all know the grizzly bear is a main feature of the California flag, but did you ever give a thought to the turf below its paws? While I can’t be certain, I and others like to think they are tussocks of our state grass, purple needlegrass (Stipa pulchra, formerly Nassella pulchra). Did you not know California had a state grass? Purple needlegrass was designated our state grass in 2004, so while it’s only been official for 10 years, this pulchritudinous pastoral plant has been an important and widespread part of our state since well before there was a California. 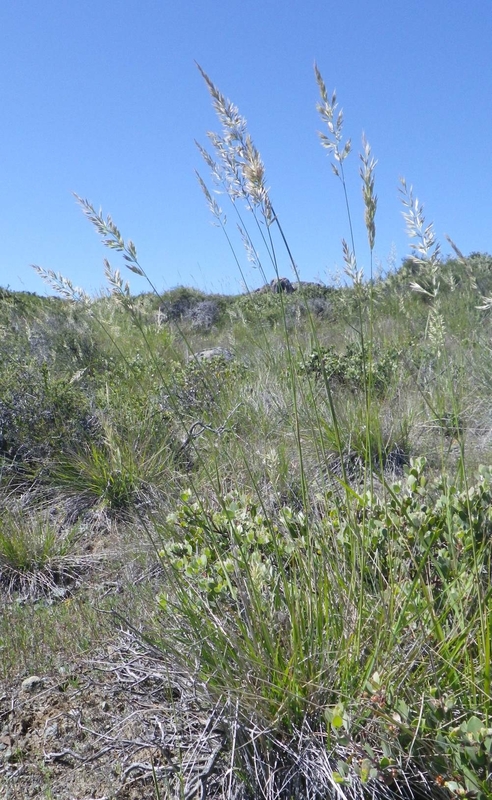 In fact, since individual purple needlegrass clumps can live more than 150 years, there may be plants alive today that have been around since before there was a California! Purple needlegrass is not only widespread and long-lived, but also quite distinctive in its look. Its inflorescence of delicate purple pennons wave above a mound of fine emerald blades. This fine look has it also available at many native plant nurseries. 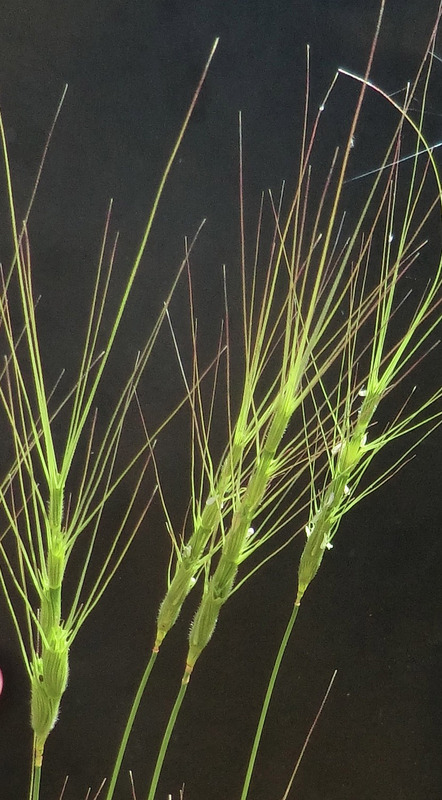 Some may mistake ripgut brome (Bromus diandrus) for purple needlegrass, but the former—a non-native annual weed—holds a fistful of red bristles on single stalks, with no basal clump of leaves. 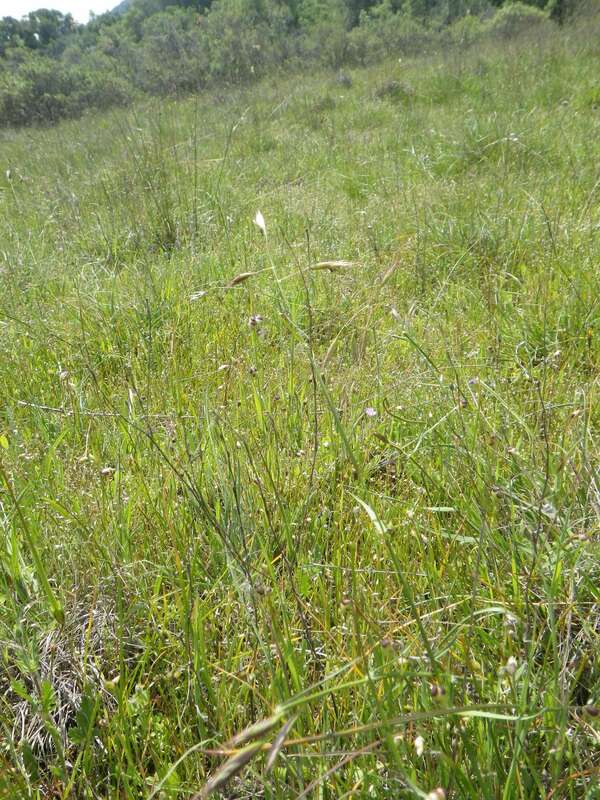 And while ripgut brome is a danger to grazing animals, purple needlegrass remains an excellent forage species—for cattle, elk, deer, or bears!